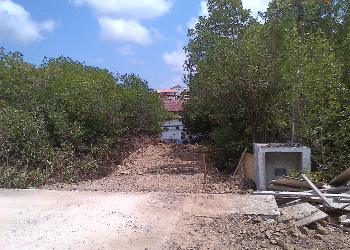 Clear-cutting of mangroves to construct an illegal pier…. Once again the fragile and threatened mangrove ecosystem of Curacao has been dealt a blow. Amigu di Tera (Friends of the Earth Curacao) has circulated this picture of developments currently underway at Puerto Oasis at Spanish Water. Mangroves had to go in favor of a pier, and what’s even worse, no permit has been issued for this development, nor requested by the developer. About 15 years ago I performed calculations of the remaining surface area of mangroves compared to about 100 years earlier, on the basis of old maps, as well as areal pictures taken at different dates. I found out that only about a third of the original mangrove fringes still existed at the time. Quite shocking. The reason these calculations were important is the fact that mangroves, together with seagrass areas and coral reefs, are the foundation of the tropical coastal ecology of the Island. Without mangroves, essential elements of the interrelationship between those 3 ecosystems will collapse, irreversibly. Breeding ground and kindergarten for lots of coral reef fish species, sediment trap, foraging area for fish, bivalves and lots of other animals species, and even coastal protection; mangroves can only be called essential, to nature and to us. More destruction should not be allowed, because in time it will kill the coastal ecosystems we depend on in so many ways. Dive tourism, fisheries, natural purification of the coastal waters we pollute indiscriminately, all these elements that are part of our current income system will then be gone. Destruction of mangroves is not a ‘business model’ worth discussing. Curacao is in desperate need of a real Marine Protected Area, based on regulations that also protect the essential mangroves. Government, please act. A huge amount of homework has already been done. What should seal the deal is political willingness and vision.